October 26, 2018 8pm: The Chapel Performance Space, Seattle, WA. Nicole Lizée’s Hitchcock and Tarantino Etudes for glitch film. This concert is in collaboration with flutist Leanna Keith. January 20th, 2018 8pm: NUMUS Northwest. Cornish College of the Arts, Seattle, WA. 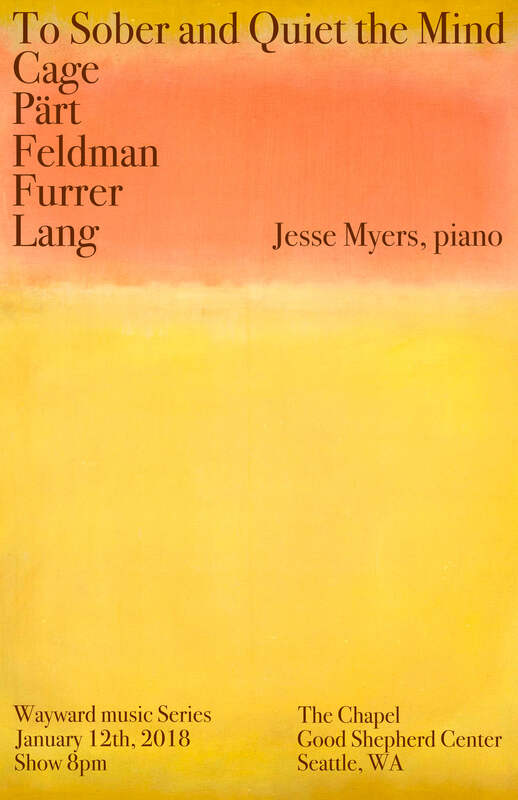 Solo piano music of Lang, Furrer, and Mazzoli. January 12, 2018 8pm: The Chapel Performance Space, Seattle, WA. To Sober and Quiet the Mind: Soft and meditative solo piano works by Morton Feldman, John Cage, Beat Furrer, David Lang, and Arvo Pärt. November 4, 2017: Capital University, Columbus, OH. Guest Artist: Jesse Myers – Living In America (solo piano music of Reich, Glass, John Adams, Missy Mazzoli, and Christopher Cerrone). Program includes solo piano music and music with electronic soundtracks and live electronics. 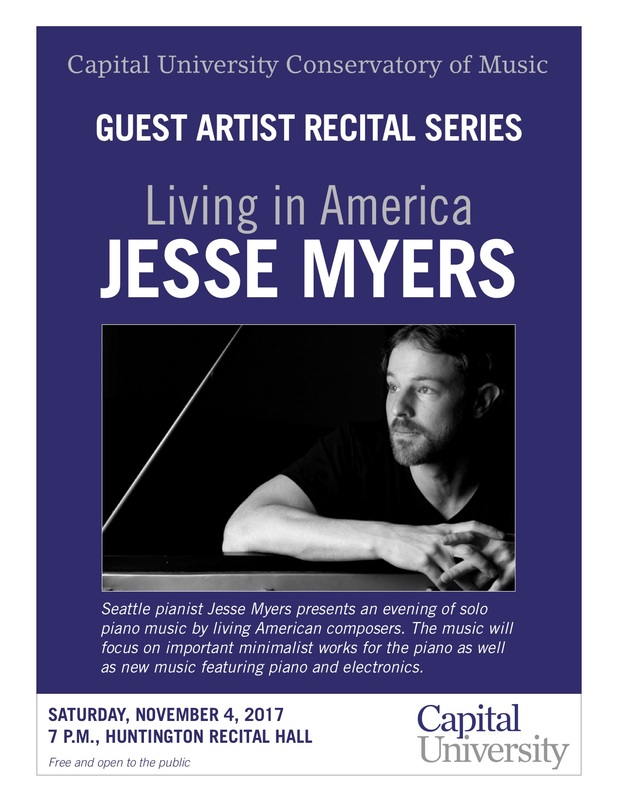 October 13, 2017 8pm: The Chapel Performance Space, Seattle – Jesse Myers: Living in America (solo piano music of Reich, Glass, John Adams, Missy Mazzoli, Christopher Cerrone, and Myers). Program includes solo piano music and music with electronic soundtracks and live electronics. Premiere of Myers’s Error of My Ways. August 26, 2017, 3pm: Carlsbad Music Festival, Carlsbad, CA – Electroacoustic piano set of the music of Mazzoli, and Cerrone. August 26, 2017, 7:20pm: Carlsbad Music Festival, Carlsbad, CA – Solo piano music of Philip Glass. 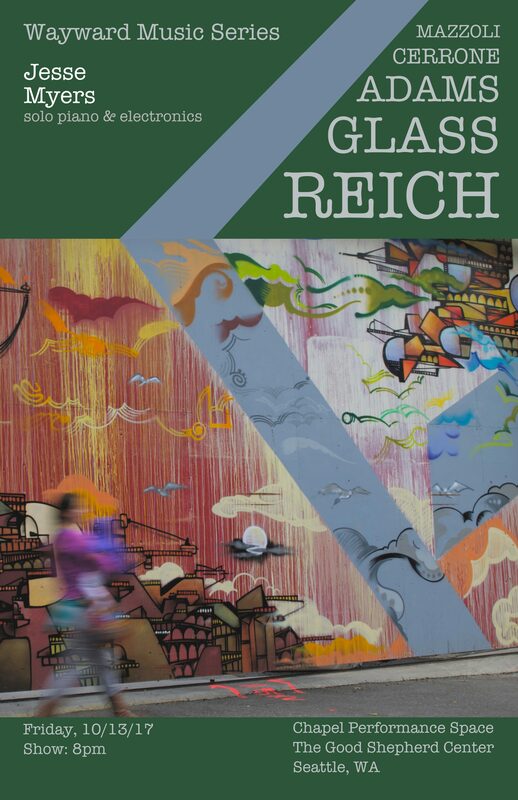 July 12, 7:30pm: The Royal Room, Seattle – Jesse Myers: Living in America (solo piano music of Reich, Glass, John Adams, Missy Mazzoli, and Christopher Cerrone). Program includes solo piano music and music with electronic soundtracks and live electronics. March-April The Piano Studio, Seattle, WA – In recording studio for production of the solo piano album “Ethereal”.